As alfalfa stands age and thin, the primary question becomes: is this stand good enough to keep? Alfalfa stands are often assessed in the spring, but our research shows that evaluating stands in the fall is better because it allows more lead time for planning. Fall evaluations help you identify less profitable fields and those likely to suffer winter injury in time to allow for fall tillage and alternative cropping strategies before fall fertilization and spring herbicides are applied for other row crops. Checking fields in the fall also helps you anticipate weed control needs. Spring evaluations are still necessary but only to assess the extent of winter damage. Wisconsin research has shown that stem count is a much more accurate method of estimating the yield potential of an alfalfa field than plant count. Plant density is a poor estimator of yield potential because an individual plant may have few shoots and contribute little to yield. Use stem count to estimate current yield potential of the field. 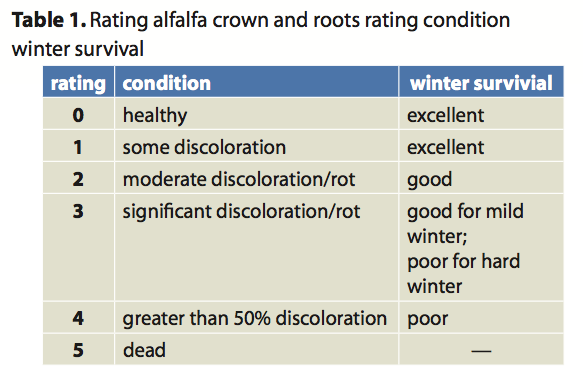 Assess root and crown health to determine future yield potential. The relationship between stem density and yield potential is constant, regardless of stand age, making this a reliable method for estimating yield potential. To use this method, select three or four representative areas of the field, marking off a 2-square-foot section in each area. You may find it useful to build a square measuring 17 inches x 17 inches using 1⁄2-inch PVC tubing or weld a cable into a ring that is 19 inches in diameter. Count only those stems that are tall enough to be harvested by the mower (over 2 inches tall). Remember to divide your count by 2 to get stems/square foot. 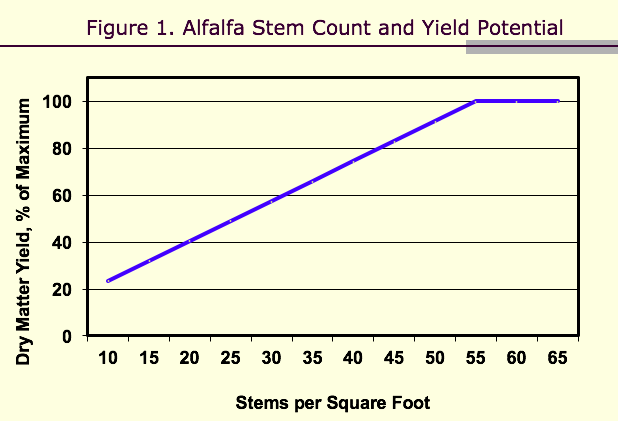 Calculate the average stem count for the field and use the graph to estimate yield potential (Figure 1). With practice, stem density can be visually estimated very accurately. Visual estimation works best when stands are 6 to 10 inches tall. Stem density estimates yield potential not actual yield. Actual yield will be less than the yield potential to the extent that management is not optimum, fertility is low, water is limiting, and disease or insect pressures exist. Assessing the health of the stand will help you estimate future yield potential as well as anticipate which fields are likely to suffer yield loss due to winterkill. Dig the plants from three or four representative locations in the field being sure to include the top six inches of the root. Examine the crowns for size, symmetry, and the number of shoots present. Then cut the root lengthwise and check for rot or discoloration in the crown and root. Use the photos and the chart below to help categorize each plant. Determine the percentage of plants in each category. Healthy stands have fewer than 30% of the plants in categories 3 and 4 (Table 1). Table 2 gives recommendations for keeping or replacing a stand based on stand density. The yield potential determined from the stand density should be considered in the context of yields normally obtained on the field and your alternatives for other hay or haylage production in the current year. For example, in years when all stands have thinned significantly due to disease or winterkill, you may decide to keep stands that you would have replaced in other years. Fields with good stem densities (>55 stems/square foot) can suffer some plant loss and still yield well the following year. Plant health becomes a major consideration in marginal stands. For example, healthy stands with 40 stems/square foot may be worth keeping while fields with more than 30% of the plants in category 4 will yield significantly less next year. As you check fields this fall for stand density and plant health, make note of the weeds present and their abundance. While we have no specific thresholds for individual weeds, you can classify the infestations as light, moderate, or heavy. Fields and areas of fields with light infestations probably do not warrant treatment. Marginal stands with moderate infestations could be treated and those with heavy infestations need to be treated. Older, heavily infested stands should probably be rotated to corn for one or two years. When evaluating weed pressures, consider their effects on forage quality. Grasses, such as quackgrass and bromegrass, will reduce the quality of the harvested forage while broadleaf weeds have less effect. This quality loss from grass weeds may be important in high-producing dairy rations but is less important for animals with lower protein and energy needs. Controlling grassy weeds will improve forage quality but not yield. Shepherd’s purse and white cockle have little impact on forage quality and seldom need to be treated. Dandelions lower the quality of the first cutting forage but have little effect on later cuttings. Hoary alyssum and yellow rocket always seriously hurt forage quality. Herbicides may be used for other reasons than improving forage quality. Dandelions, for example, are wetter than alfalfa and increase drying time. Make maps of the marginal fields to replace and fields to consider treating for weeds next spring. If grassy weeds are the only problem, Poast Plus is the least expensive method of control. Poast Plus can be used to suppress quackgrass when it is 6 to 8 inches tall. If both grassy and broadleaf weeds are present, a dormant application of Sencor, Lexone or Velpar may be applied for weed control. Copyright © 2011 by the Board of Regents of the University of Wisconsin System doing business as the division of Cooperative Extension of the University of Wisconsin-Extension. All rights reserved. Send copyright inquiries to: Cooperative Extension Publishing, 432 N. Lake St., Rm. 227, Madison, WI 53706, pubs@uwex.edu. Authors: Dan Undersander is professor of agronomy; Craig Grau is professor of plant pathology; Dennis Cosgrove is associate professor of agronomy; and Jerry Doll is professor of agronomy; Neal Martin is professor of agronomy. Undersander, Grau, and Doll hold appointments at University of Wisconsin-Madison and University of Wisconsin-Extension, Cooperative Extension; Cosgrove holds an appointment at University of Wisconsin-River Falls; and Martin holds an appointment at University of Minnesota-Extension, Cooperative Extension. Produced by Cooperative Extension Publications, University of Wisconsin-Extension. University of Wisconsin-Extension, Cooperative Extension, in cooperation with the U.S. Department of Agriculture and Wisconsin counties, publishes this information to further the purpose of the May 8th and June 30th, 1914, Acts of Congress. An EEO/AA employer, the University of Wisconsin-Extension, Cooperative Extension provides equal opportunities in employment and programming, including Title IX and ADA requirements. If you need this information in an alternative format, contact Equal Opportunity and Diversity Programs, University of Wisconsin- Extension, 432 N. Lake St., Rm. 501, Madison, WI 53706, diversity@uwex.edu, phone: (608) 262-0277, fax: (608) 262-8404, TTY: 711 Wisconsin Relay. This publication is available from your county UW-Extension office (www.uwex.edu/ces/cty) or from Cooperative Extension Publishing. To order, call toll-free: 1-877-947-7827 (WIS-PUBS) or visit our website: learningstore.uwex.edu.